One day this summer, I was making strawberry shortcake. Just as I was adding a little fresh lime juice to add zing to the strawberries, I looked up and noticed my liquor cabinet door was ajar, and peeking out was a bottle of Cuervo Gold. I looked at the lime juice I was holding and BO-ING!!?!! – a light bulb went off! “What else goes great with lime juice?” thinks I. Well, you see where this is heading. Minutes later, I was sipping an icy margarita from one hand, and pouring another over my strawberries. A match made in heaven. 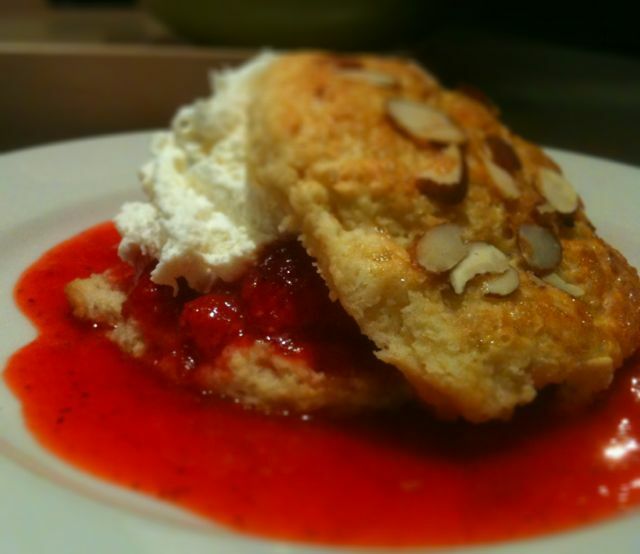 The shortcakes are just slightly sweetened baking powder biscuits with some sugar and almonds on top, so don’t fret about how fancy this is. Our grandmothers made biscuits with every meal, at least mine did, and it’s truly simple. My instructions use a food processor, but you can just as easily cut the butter into the flour with a pastry cutter or a fork, and then finish the job with your fingers. I actually prefer to get my hands into it because it makes me feel more akin to those aforementioned, and dearly departed, grandmothers. I miss them. If you need to make a virgin version of this, omit the alcohol and just use the lime juice and sugar to macerate the strawberries. I often make both versions when I know there will be youngsters or folks who are avoiding alcohol at dinner. The upside to this scenario: because I only need to add half the margarita to the alcoholic half of the fruit, I get to drink the rest. This is what we call a ‘win-win.’ Even better, make a double batch of the margarita and save time later! Wash and hull the strawberries. Slice half of the strawberries. Put the rest of the strawberries in a bowl and crush them with your bare [and impeccably clean] hands. Add the sliced strawberries and sugar, stirring to mix. Measure the tequila, triple sec and lime juice. Pour an ounce (or two) over ice and taste. Pour the rest over the fruit and stir to mix. Let sit at room temperature for 1-2 hours. Make another batch of margaritas–I mean, you have all the ingredients out anyway, right? Go ahead and make a double batch. It’ll just save time later, trust me on this. Chill the mixing bowl and whisk attachment of your mixer in the freezer for 20 minutes. Then whip the cream, vanilla and sugar on low for 1 minute. Increase speed to high and whip until the cream has doubled in volume. Transfer to a bowl and cover with plastic wrap, or spoon it into a ziplock bag, and chill in the refrigerator. Place oven rack in lower-middle slot and pre-heat to 425 degrees. Pat the dough into a circle ¾ inch thick. Use a floured biscuit cutter (2 ¾ inches) to cut 6 shortcakes. Place them one inch apart on a baking sheet (a Silpat mat or parchment is your friend here) and cover with plastic wrap. Place in the refrigerator for 20 minutes or up to 2 hours. Remove and brush the tops with the beaten egg white. Sprinkle the shortcakes with the sugar in the raw and the sliced almonds (you kind of have to make sure those almonds stick to the egg!) and bake for 12 to 14 minutes, until golden brown and delicious. Let the shortcakes cool on the pan for 10 minutes. Split a shortcake in half. Place the bottom half on a plate and spoon a generous amount of fruit on the shortcake. Dollop whipped cream on the fruit, or pipe it on from the ziplock bag by cutting off a corner and squeezing it out (this is a great way to store the extra, too). Top with the top half of the shortcake. Serve with some tea or coffee or mix up some more of those margaritas – on the rocks with salt, please – and invite me over!